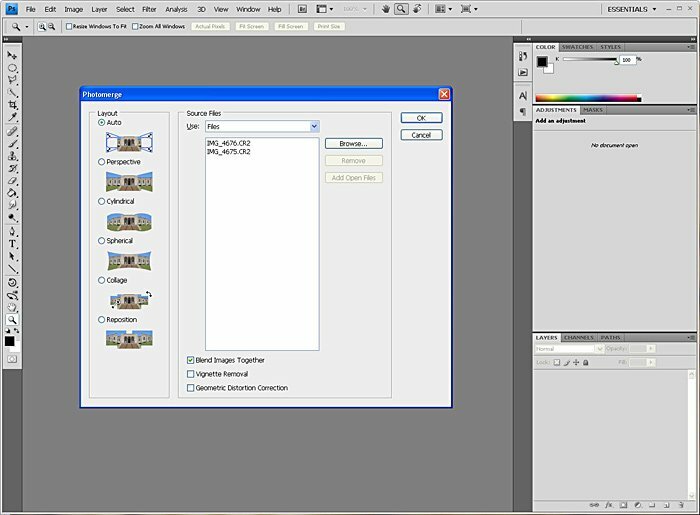 Yesterday, I discussed how-to use Photo-merge in Photoshop CS4 to create a panorama. Well, you can also use Photo-merge to increase the depth of field of a photo. In macro-photography, depth of focus can be very narrow. Photo-merge will allow you to take multiple photos at different focusing depths and combine them together. In the image on the left, the pistil and stamen are in focus. 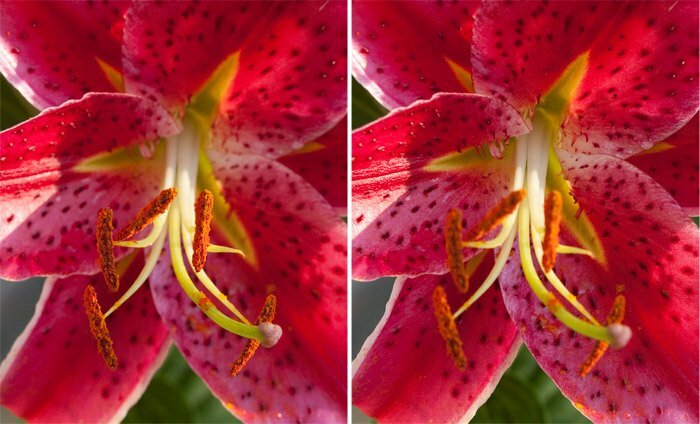 In the image on the right, petals are in focus. These two images were hand-held, but that’s ok with Photoshop. Start with Photoshop CS4 with no open documents. Go to File > Automate > Photomerge. In the Photomerge dialog box, use the Browse button to find the photos to be merged. Use the default Layout set to Auto to start. 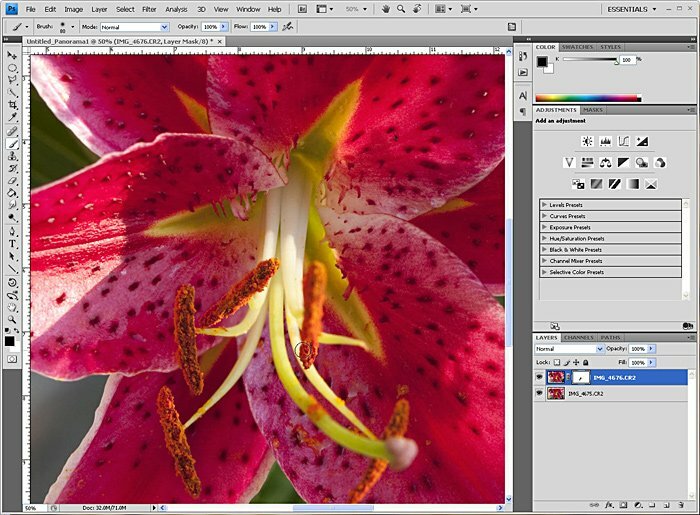 As part of the photo-merge, Photoshop will automatically align the images, blend the images and fix color shifts. Each image on its own layer using masks to produce the complete image. 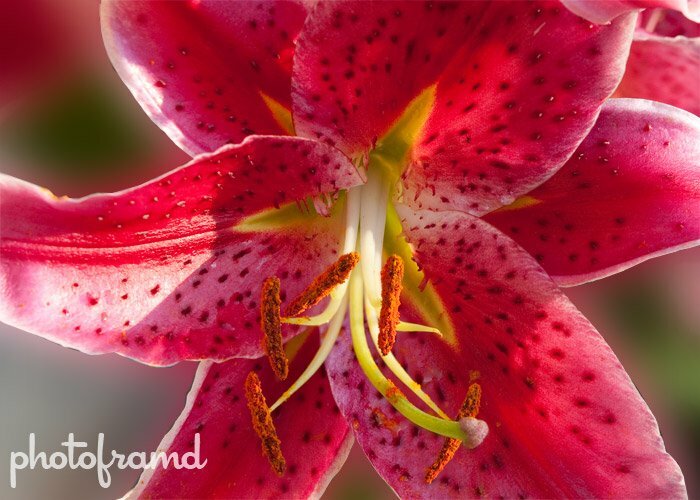 But, if you look at the bottom petals of the Stargazer, they are out of focus. Photoshop used the wrong photo for that part. Photoshop properly aligned and blended the colors of the two image. But, I can merge the images better by hand. I deleted the two masks that Photoshop created. The top photo is the one with the sharp stamen and pistil. I added a blank mask to this layer with a pure white fill. Using a large soft brush, I drew over the stamen and pistil in the mask layer with pure black to reveal the sharp image. With the sharpest parts combined into one photo, I cropped the image to accent the best part of the Stargazer. To further enhance the composition, I created a selection around the flower and blurred the background to remove any distraction from the flower. This did NOT work/was not very specific. I did exactly what you said and photoshope just created this really tall image and stuck my images in it from top to bottom. It was completely stupid. Either photomerge isn’t that great your YOU are just not that great. No matter what settings I pick photoshop wants to rearrange the images and there are no extra options. 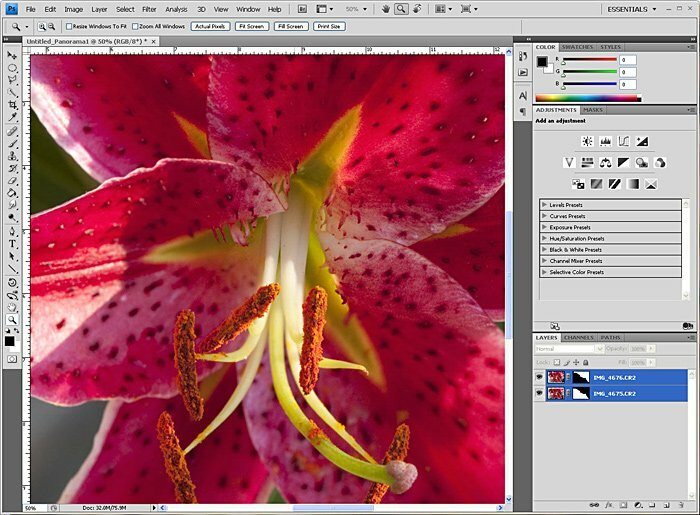 Are you sure you did this flower example with photoshop? Are you using Photoshop CS4? CS3 did not have this feature. If you are using CS4, is the Blend Images Together option checked? Photoshop should align both images over each other and try to build a mask blending the two. Once you get that far, it really is that easy. And, yes I used these flower images. You are looking at screen captures recording my progress. WOW! I’m sorry that you have to deal with someone leaving such a rude comment on your blog! This was just what I was looking for, and works perfectly on CS4. Thank you. Thanks! I think he was frustrated because he was using CS3 not CS4. Adobe enhanced the Photomerge in CS4 to create Blends on top of each other. Pretty easy right?? Came across this whilst searching for plugins to do the same. Great technique that works perfectly, didn’t realise you could do this within Photoshop without purchasing plugins (that’s even if they exist). Thanks for showing the way. Works fantastic on CS4, I am also embarrased that some one has to be so rude when you are trying to help and give advise. Thanks for your efforts. Glad to be helpful! I think the first person was using CS3, not CS4. Adobe changed the functionality in CS4. Maybe I have too many files to merge.